A mid-coast Maine village where fishing is the way of life. CUNDY'S HARBOR, ME. - South of Brunswick, Me. lie the Harpswells, jutting into Casco Bay with their rocky, irregular coast and myriad islands. If you 'drive out from Brunswick, turning south at Cook's Comer just beyond the Naval Air Station, you'll cross a bridge-at "the Gurnets" and find yourself on an island shaped. somewhat like a huge, twin-tailed horseshoe- crab: It's Sebascodegan, or Great Island. All the Harpswells -consist of (from west to east) Harpswell Neck, Bailey Island, Orr's Island, and Sebascodegan. When you cross the bridge at Gurnets, you're on Route 24, which, if you take it straight, will lead to Land's End on Bailey. But if you turn off to the left on an unnumbered route, you slip down to a point on Sebascodegan where the little village of Cundy's Harbor suns itself on good days on the rocky-shores of the New Meadows River. No one knows just where Cundy's Harbor begins or ends. It depends on to how you look at it. The sea boundaries are easy, but by land some favor one boundary, some another. Anyway, it's all in the Town of Harpswell; and all of Sebascodegan makes up East Harpswell, presided over by Selectman Gustavus (Gus) O. Gatchell of Pinkham Point for the past 21 years. Cundy's is almost 100 per cent fishing, the lobster part of it representing about 5,000 traps. 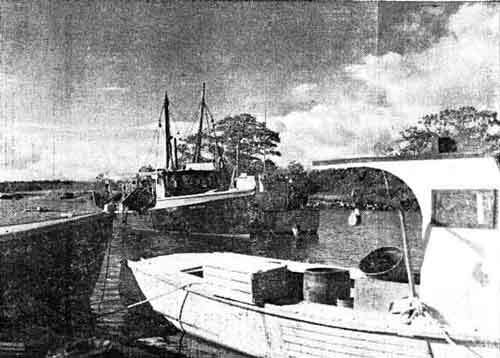 Rebecca H, Merton Darling,, and St. Joseph II, Daniel and Bee Darling, both draggers equipped with gear for flatfish, groundfish, shrimp, and whiting dragging; Sea Cloud, Clyde Westcott, and Barbara L., Walter Toothacre, both herring seiners; Madelyn C., David Darling; Three-in-One, Charles Goodwin; Leola, Maurice Darling; Vida E., Ernest Morgan; Navajo, Clifton Morgan; Drift-Wood, John Morgan; Rebecca I, Merton Darling; Kandy, William Ganske; Big Jo, Freeman Davis; Jeanette F., Dana York; and other excellent no-namers owned by John Eastman, John Eastman, Jr., and Wesley Alexander. Cundy's, named after William Condy, who settled there in 1733, is a quiet village.' You'd think there was nothing going on. You'll see boats in the harbor, but most of the men will be out hauling traps, or dragging for flatfish, groundfish, shrimp, or whiting, depending on the time of year. If you drop in at Watson's General Store, you'll find Sid Watson presiding at the counter, ready to sell you anything from ice cream to life jackets and plastic boat letters. Sid's great-grandfather set sail in a schooner from Gloucester, Mass., with his family and all his goods, bound for Boothbay Harbor. That was about 90 years ago. Beleaguered by a severe storm, the great-grandfather, Robert Watson, sought refuge up the New Meadows River and anchored in Cundy's Harbor. After the storm broke, Sidney, his son, decided to stay at Cundy's with his family. 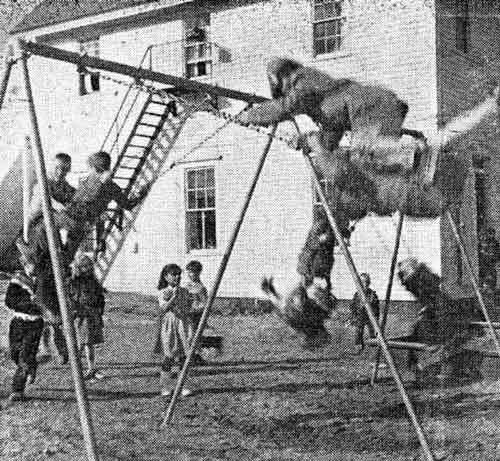 Father Robert went on to Boothbay, where many of his descendants still live. For five generations, the eldest sons of the Watsons have alternated with the name Robert and Sidney; so the present Sid Watson's oldest son, 13, is named Robert, the 5th generation at Cundy's. 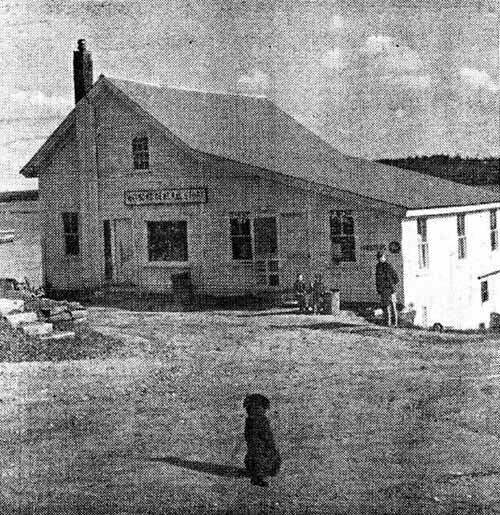 Originally, Cundy's peninsula was settled by farmers, but Sid's grandfather engaged in the saltfish business and founded Watson's General Store. Besides running the store,. the present Sid has a lobster business on a small scale, buying from 8 to 10 lobster fishermen. He says the lobster business is not what it used to be, because of competition and the fact that lobsters don't seem to be rugged as formerly and don't survive as well. A little farther south, you'll come to Holbrook's Store and Wharf right -at the end of the public - road. You'll be greeted there by Mrs. Christine Miller, -store owner and postmaster, whose father, Edward Holbrook, bought the store from Albert Ridley in 1908 and ran it until his death in 1953. 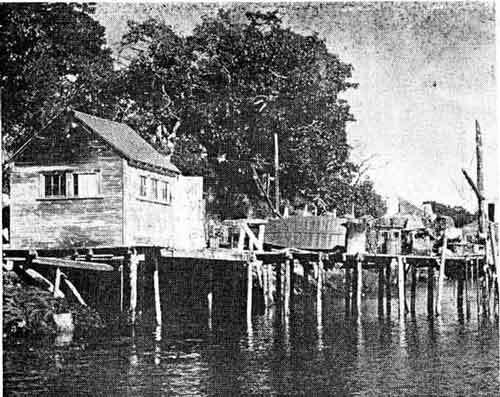 In the early 1900's, the store and-wharf did a big salt fish and grocery business, people coming across the New Meadows River - from Phippsburg and Sebasco to do their trading. 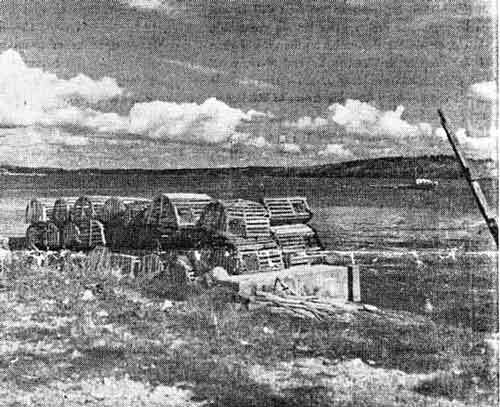 Today, however, because of increased transportation facilities, 90 per cent of Mrs. Miller's business is in lobsters. She can. store about 10,000 pounds at once, turning over about 100 tons a year. At the peak' of the season, she buys from about 25 -fishermen, and from five or six -in the winter. -' .
. Again, take the new Community Hall and Fire Station. About seven years ago, the need for such facilities was so great' that about ten towns got together and signed a note in order to provide this building, whose exterior was completed five years ago. About a year ago, with the feeling that the building was not amortizing fast enough the women of the town got'~together and formed the Cundy's Harbor Volunteer Firemen's Auxiliary. Their purpose, which has been well realized, was to raise money by suppers and other affairs for the building. The people of Cundy's are happy. They are also genuine plain, ordinary intelligent people. There is a quiet take-us-or-leave us attitude, but it is gentle and based on kindness, not flaunted in your face. There seems to be a reason for everything in Cundy's, a lack of aimless- drifting, yet the pace is slow and comfortable. TWO DRAGGERS, the Rebecca H and the St. Joseph II, the former owned by Merton Darling and the latter by Daniel and "Bee" Darling, lie side by side just off Ridley Channel. The mooring is on the Oakhurst Island side of Cundy’s. These draggers are used for flatfish, groundfish, shrimp and whiting. 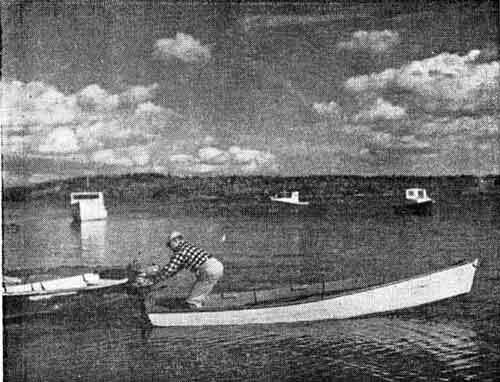 Two seiners and a number of lobster boats are included in the village fleet. THE NEW MEADOWS RIVER is broad and peaceful in northeast. An estuary reaching well. Inland, ratfier than a brook above tide water. No matter where one wanders pile of lobster traps. THE YOUNGSTERS have a good time, too. These children in the sub-primary and primary grades include Gail Lucas, Susan Purinton, Robert Anderson, Kelvin Wilson, Patricia Lucas, Herbert Morgan. David Blanchette and Barbara Dunning. Mrs. Ronald Huston and Mrs. Eva Warren, the teachers, are about to ring the bell. EARL WORRY'S FISH HOUSE is one of the few along the Cundy shore. It is located between Holbrook's and Watson's stores near the center of the village. While such docks are pleasant scenic attractions, their use in this fishing village is utilitarian only, the local people being more concerned with 'fishing-than in catering to summer visitors. 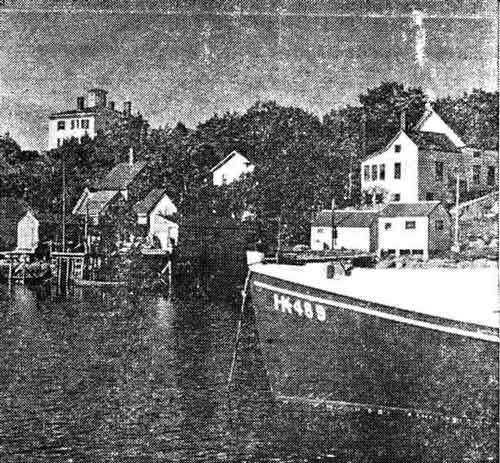 PART OF THE VILLAGE rising steeply above the harbor can be seen over the bow of freeman Davis's lobster boat. The large Richard Hatch home on the hilltop offers a superb view of surrounding waterways. A DOG NAMED PATCHES appears to enjoy being coaxed by Sidney Watson, owner of Watson's General Store. Stephen Davis and Watson's son, Thomas, (the fifth generation of his family in Cundy's), look on with great interest. 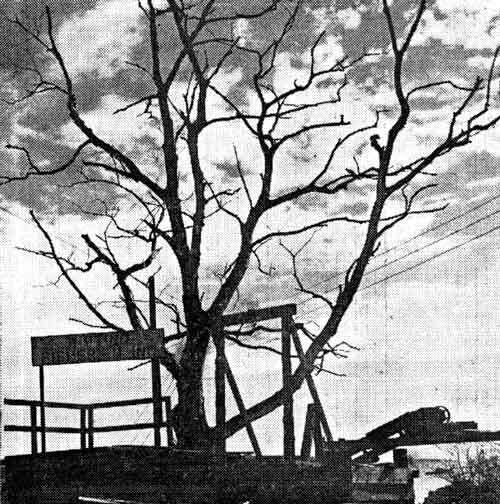 WATSON'S WHARF, once leased by Whiting Fisheries, Inc., is now as dead as the lifeless tree that marks the spot. There is talk of reviving business at this site in the form of a freezer plant. 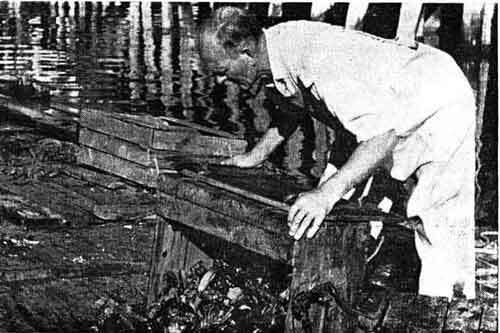 INTO THE CAR on Holbrook's wharf goes a crate of lobsters, dumped there by Ivan Bowie. These storage facilities, owned by storekeeper Mrs. Christine Miller, can handle 10,000 pounds of lobsters at one time. About 100 tons of lobsters go through Holbrook's cars each year. Mr& Miller buys from only six or seven fishermen in the winter, although the number may go as high as 25 in the summer. 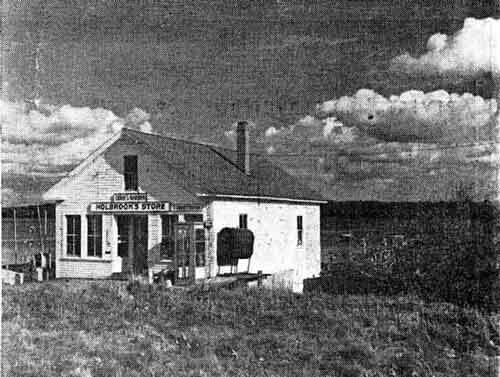 HOLBROOK'S STORE is an excellent example of, a.tr once did a large grocery business when people,cgme, acres to purchase their supplies. In, contrast, about 99 per, cent retail We of lobsters. DOUBLE DUTY is one way to describe the work of Mrs. Christine Miller, owner of store and wharf. 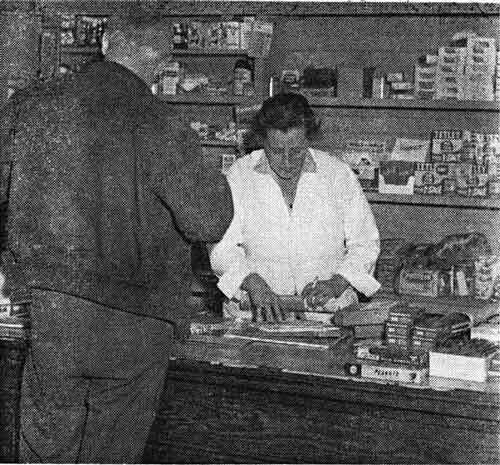 Since the post office is located in her store, she serves as postmistress Here she looks over the mail before Robert Simson, mailman, starts his rounds. THE OUTBOARD MOTOR is popular at Cundy's, too, and is used more and more for sport and commercial fishing. Here Paul Tiemer, a former summer resident, now living in the village year round, gets underway from Holbrook's wharf. A variety of craft, ranging from rowboats to draggers, is based at the harbor and nearby Oakhurst Island.